I was super reluctant to try out a pair of crack gloves… While I have taped my hands in the past for certain routes, the idea of wearing a crack glove really seemed like cheating! Nonetheless, I gave them a try and it is hard to go back now! For me, the real advantage is taking them on Alpine rock routes. First, they are much lighter than carrying a roll of tape on a long approach. 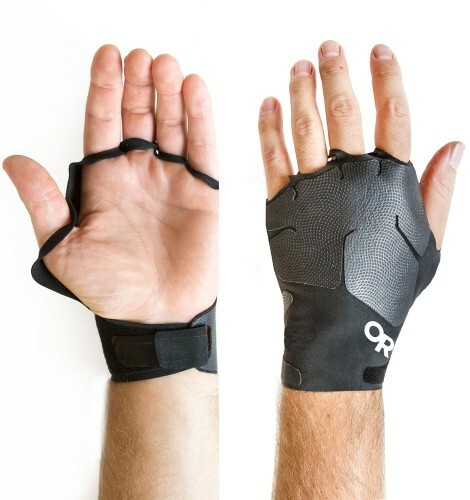 Second, they take seconds to put on opposed to making a decent tape glove, which makes them super convenient to wear when you need them and take them off when you don’t. Often on a long alpine route there may only be a pitch where taping up would be nice, so with the Splitter glove clipped to your harness you can easily put them on and save some damage to your skin! These gloves are super light and much less bulky then many of the other crack gloves offered. They seem like they could be destroyed in one pitch, but I have worn them on several outing and so far they are stood up very well!